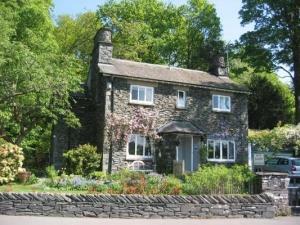 Stockghyll Cottage015394 43246work Bed & BreakfastThis beautiful, traditional Lakeland stone cottage overlooks the Lake and is set in a traditional wooded area that has a stream and waterfall in the lovely gardens. Yet it is less than 10 minutes level stroll to the restaurants and pubs of Bowness town centre. The 3 ensuite rooms are tastefully decorated and wonderfully cosy. Each ensuite features a shower. The rooms have TV, radio-alarms, hair-dryers and drink-making facilities. We provide towels, tea, coffee, fruit teas and chocolate. You may borrow a brolly or a torch to help you home in the dark. We can suggest places to visit and lend you detailed local maps to help you find them.